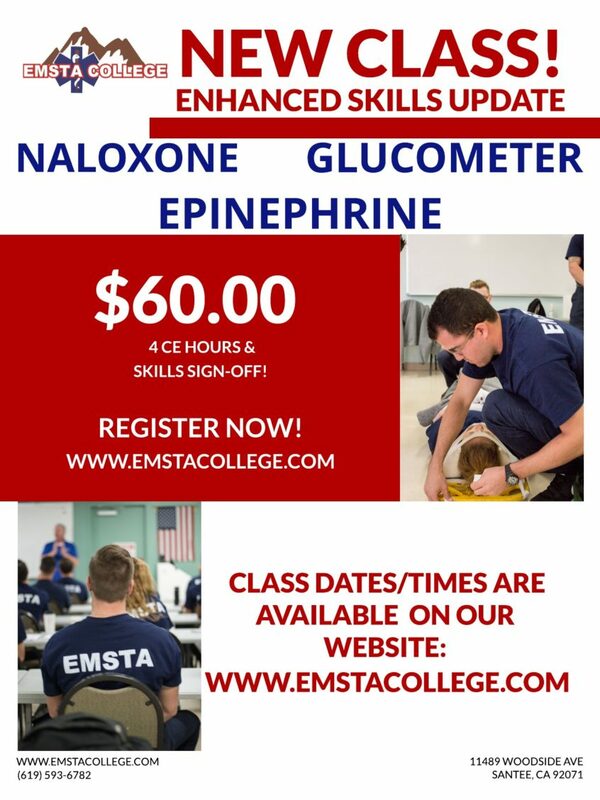 EMSTA is now offering a new class to all certified EMT’s in the State and San Diego County who need to provide proof of certification for the County’s required 2019 enhanced EMT skills; Naloxone and Epinepherine administration, as well as the use of Glucometer for EMT’s. This class does not offer the student any other State/County skills competency approval, only the new County required skills competency for Naloxone and Epinephrine. Students who need all of the required skills competency signed off on form SCV(01-17) can register for our next Refresher class or for the “Skills Only” day of the Refresher course. All class dates are posted and available for registration. Classes will be $60.00 and provide 4 hours of CEU’s and a State/San Diego County Certification of skills competency for those skills.